I rather enjoy walking in the woods not far from home; calling it “hiking” might be a bit of an exaggeration, since the areas I frequent are wide, well-groomed trails not far from civilization, for the most part. But I thought it might be nice to take a short hike (about 6.5km) through the Pyramid Mountain Natural Historic Area (map here). Now, I could do 6.5km in town on paved streets without really trying, but hiking in the woods is a different matter. The trails here are well-marked, but not nearly as well-groomed as I’m used to — but that’s probably the city girl in me. I had to watch my footing carefully to be sure not to turn an ankle on a root or one of the many, many fallen acorns. That was what made the most noise in the forest while I walked, other than me: acorns falling off of the trees. I’m surprised I didn’t get beaned. The first part of the trail was pretty steep, with even a few switchbacks to keep the adventure from transitioning from “hiking” to “climbing”. I took the Blue Trail from the Visitor’s Center to the first overlook, and was treated with the above view from the top of Pyramid Mountain. I believe that the water you can see at the bottom is part of the Taylortown Reservoir. Obviously this hike was taken a few weeks ago, before the leaves started to change; I imagine that the view must be even lovelier with the fiery colours of fall. 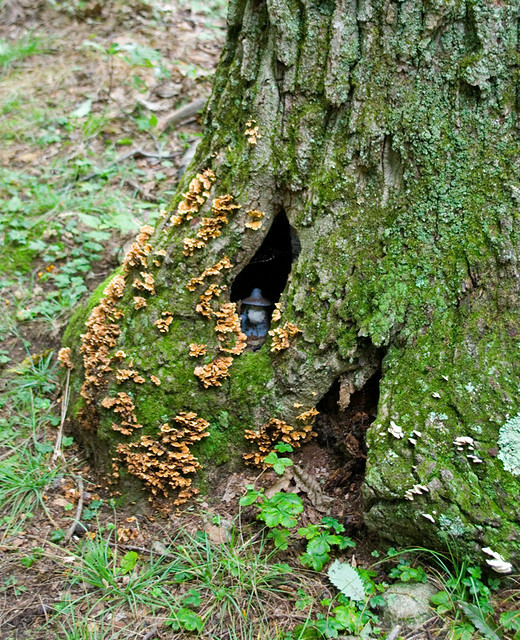 Continuing on, I was paying such careful attention to my footing that I almost missed this tiny little wizard hiding in a tree. 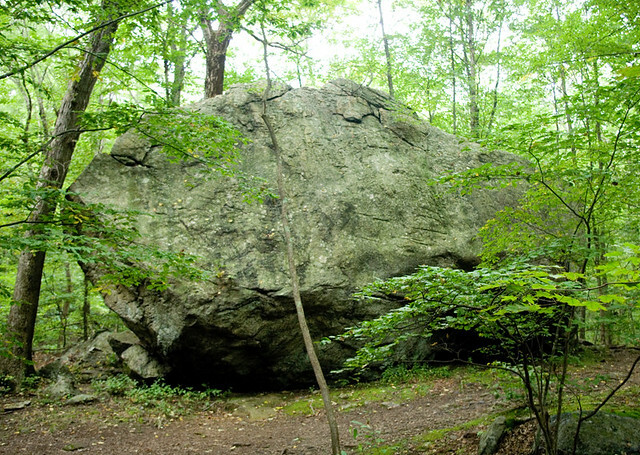 The Blue Trail continued to Tripod Rock, which is a glacial erratic, which is basically a large rock dropped by the Wisconsin Glacier that doesn’t geologically match the stone in the surrounding area. 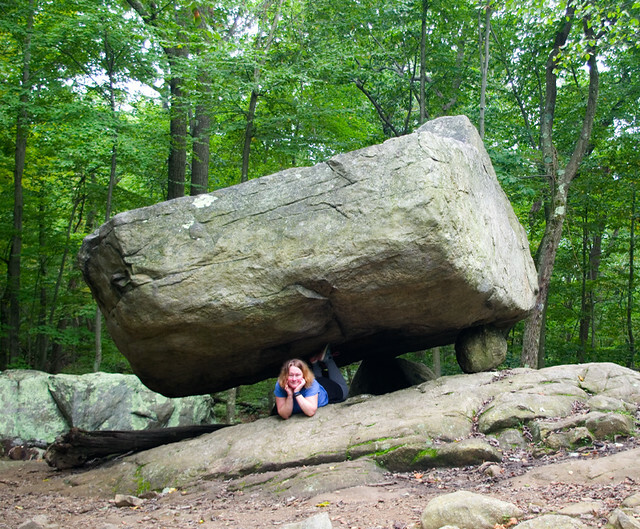 It’s also called a perched boulder because, well, it’s perched on three smaller boulders. 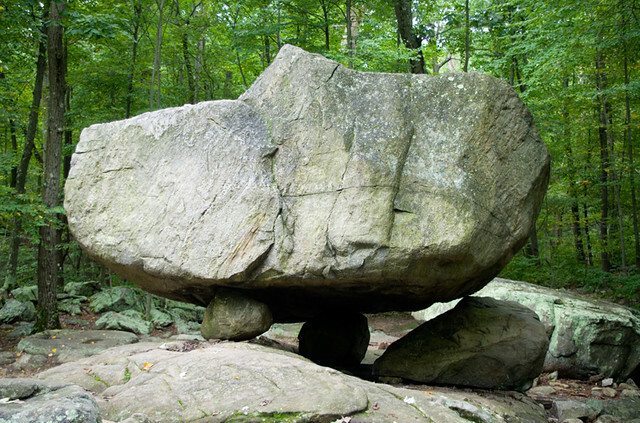 As precarious as this placement may seem, it’s a very sturdy formation and isn’t likely to shift anytime soon, barring human intervention. 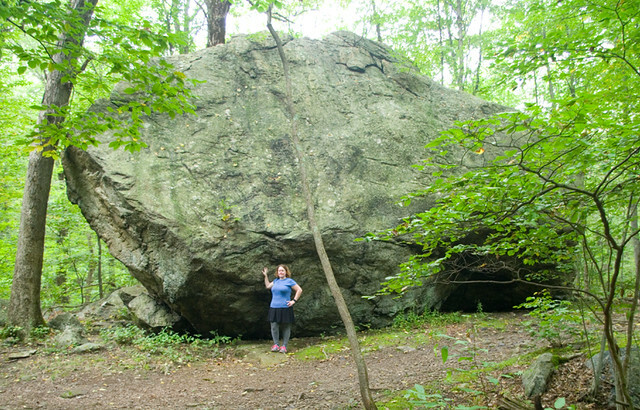 Here’s a shot of me with the rock for scale. Please excuse the frizzy hair; it was very hot and humid that day! I should have brought a hair clip. I took these photos with my camera propped up on the bedrock outcrop that is mentioned on the Wikipedia entry map, if you’re trying to figure out the orientation. 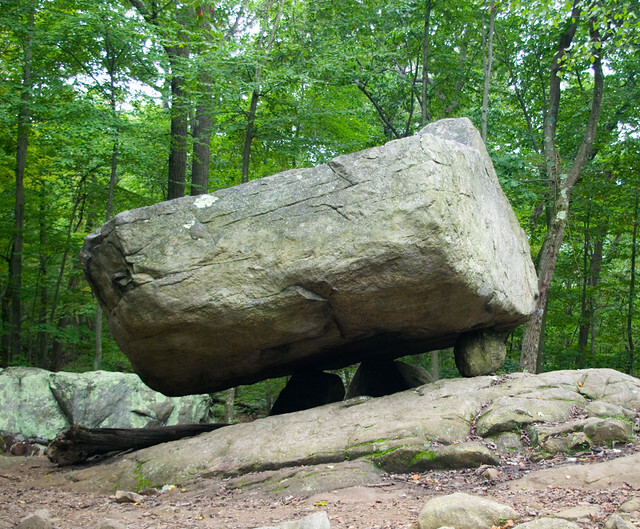 From this angle you can see the supporting tripod of boulders more clearly. This photo was taken from the little bridge over Bear House Brook; my camera was propped up on one of the railings. After this point I misread a trail marker and ended up halfway through Bear Swamp before the masses of mosquitoes clued me into the fact that I’d made a wrong turn. 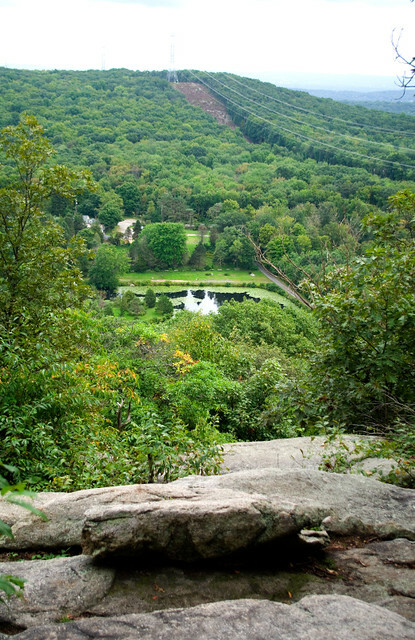 Then I hiked back to Bear Rock, took the White Trail to the Blue Trail back to the visitor’s center and my car. Except for my wrong turn, which was entirely my own fault, this was a lovely hike and I highly recommend it! The rock formations are very interesting and make great destinations.